One of my very favorite soup recipes is from Olive Garden so it was a must that I come up with an Olive Garden Copycat Recipe for Zuppa Toscana Soup! Have you ever tried it? I cannot believe how easy it is to make at home too. You just need the right ingredients to make it taste exactly the same. I’ve tried this recipe over and over again with different bouillon recipes without getting that exact flavor until I used the Better Than Bouillon Chicken Base found here on Amazon. Don’t get me wrong now. All of them tasted really good but I was looking for an exact recipe. I’m a bit picky. It’s my #1 favorite soup so it was totally worth the effort. You can use the low sodium or the regular chicken base to get the same flavor. It’s worth buying this exact bouillon. 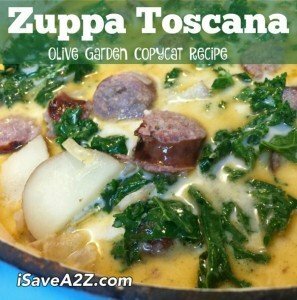 I’ve also tried this with many different sausages and I’ve found the mild Italian sausage flavors work best. I promise that you will love this recipe once you try it! Be sure to report back and leave me a comment if you did! I love reading how you use these recipes and whether or not you like them. Start by cutting both potatoes into large chunks as seen in the photos. You don’t want small pieces of potato because you need it to stay in tack when it’s cooking. If they are cut too small it may turn to mush. Next brown your sausage in the same pot you plan to use for the soup. After the sausage is completely brown add the water, onions and potatoes. Now add the garlic and bouillon. Stir it until all the bouillon has been incorporated into the soup. Let this cook over medium heat until the potatoes have fully cooked and are soft. Lastly add the heavy whipping cream and the kale leaves. Be sure to tear the kale leaves into bite size pieces. Cook for a few minutes more until the kale leaves are soft. Tip: You can also make this in the crockpot or slow cooker. Just be sure to brown the meat and cook it on low for about 4 hours. Add the kale leaves and heavy whipping cream towards the end just before serving it. Start by cutting both potatoes into large chunks as seen in the photos. You don't want small pieces of potato because you need it to stay in tack when it's cooking. If they are cut too small it may turn to mush. By Jennifer on December 30, 2016 Crockpot, Recipes, Soups, Trending Topics. Just made this for dinner. I found the BETTER THAN BOUILLON CHICKEN BASE at my local King Soopers. Thank you for the recipe.